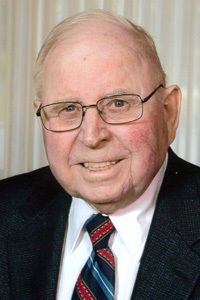 Warren Edwin Scott, 88, of Webster City, passed away Thursday, April 4, 2019, with his loving family by his side. A service to celebrate Warren’s life will be held at 10 a.m. Monday, April 8, 2019, at the Calvary United Methodist Church in Stratford. Presiding over the ceremony will be Gina Spohnheimer. A visitation will be held from 3:00 to 5:00 p.m. Sunday, April 7 at the church. Foster Funeral and Cremation Center in Webster City is assisting family with arrangements. Surviving to honor his memory is his devoted wife of 68 years, Peggy; and their children, Karol (Marshall) Beard, LouRene (Murlin) Iles and Mark (Sherri) Scott. He was blessed with three grandchildren and five great-grandchildren. Also surviving Warren is his sister, Mary Ferguson of Dayton and sister-in-law Lila Scott of Boone and many nieces and nephews. He is preceded in death by his parents, Harold and Louise Scott as well as his brothers, Wendell and Loren Scott and his infant son, Rodney Alan. Warren was born on October 15, 1930, in Stratford, the son of Harold and Louise Scott. He was a graduate of Stratford Community High School. On August 19, 1950, he married Peggy Stolte. He and his brother, Loren, owned Scott Plumbing and Heating in Stratford. Warren was known for his willingness to help others and his community. His big smile will always be remembered. He could visualize, design and build anything. He had a way of looking at something and figuring out how to make it better. He loved creating the working scale model road grader, bulldozer, semi-tractor and Barbie car for his grandkids. In lieu of flowers, the family encourages people to perform kind deeds to others and donate to a charity of their choice.